By default, the Deformation toolbar only contains the essential options. If you right-click on the toolbar and select Customize, you can add additional buttons—see About Toolbars. The Rigging tool is used to create a Bone deformation chain. You also use it to set up the resting position—see About Chain Creation . To learn more about the Rigging tool's properties, see Rigging Tool Properties. Displays the deformer manipulators for the selected drawings or selected deformers in the Camera view, and hides all other deformer manipulators—see Displaying Selected Deformation Controls to learn how to make the manipulators visible in the Camera view. When several points from a curve or envelope deformation chain are selected, this displays a manipulator bounding box around them. 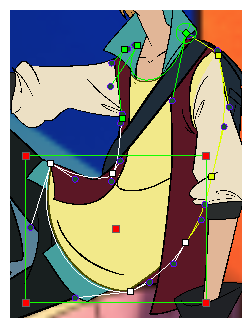 Using this manipulator, you can move, rotate and scale the selected points together.